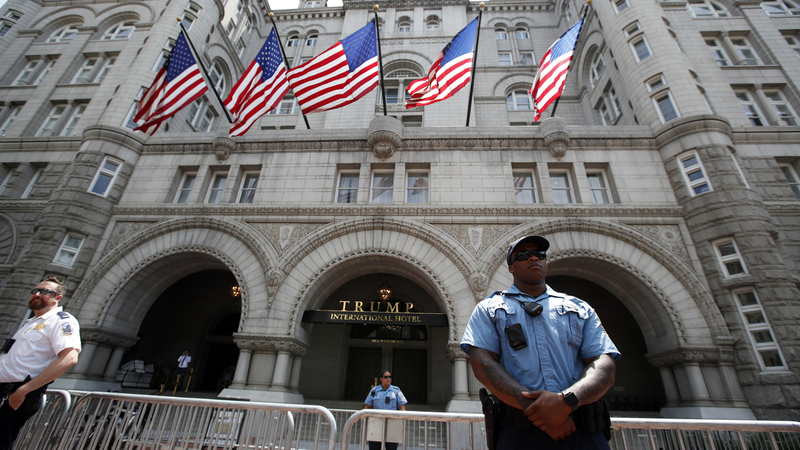 Emoluments Lawsuit Against Trump Can Go Forward, Judge Says The plaintiffs are expected to ask for documents concerning the finances of the president and his businesses, which are normally closely held. The Trump International Hotel in Washington, which is at the heart of an emoluments lawsuit brought by two state-level attorneys general. A lawsuit accusing President Trump of violating the constitution's emoluments clause can proceed, a federal judge said Friday. Never before has an emoluments case gone to trial in the U.S.
Federal District Judge Peter Messitte denied Trump's request for a stay and ordered the two parties to begin the discovery process. The ruling means the plaintiffs, the attorneys general of Maryland and Washington, D.C., have some power to obtain documents from the president and his business ventures. Trump notably has not released his tax returns and has maintained ownership of his businesses. Karl Racine, the D.C. attorney general who is up for re-election Tuesday, called the news a big win. "Our case is moving forward, and we will continue to work to stop Trump from illegally profiting from the presidency," he tweeted. As far back as Jan. 2017, Trump's legal team has pushed back against emoluments concerns. "Paying for a hotel room is not a gift or a present, and it has nothing to do with an office," Trump lawyer Sheri Dillon said before the president's inauguration. As NPR's Peter Overby has reported, the lawsuit claims Trump violated two different clauses in the constitution, known as emoluments clauses: one that forbids federal government officials from accepting gifts from foreign government officials, and another that says the president may not accept benefits from state governments. Peter has written that the plaintiffs will be interested to learn more about the foreign dignitaries who have been noted staying at the Trump International Hotel a few blocks from the White House. At the same time, some 200 Democratic members of Congress are suing the president over violations of the emoluments clause. A judge in Washington, D.C., district court ruled in September that the lawmakers have standing to sue the president. The Trump International Hotel, which opened shortly before the 2016 election, has invited scrutiny since Trump took office. An investigation by member station WAMU and Reveal showed a Malaysian prime minister spent money at the hotel while the subject of a government corruption probe. Additionally, as NPR's Jackie Northam has reported, the hotel's lease, which is through the Government Services Administration, explicitly says no U.S. elected official may hold that lease — a clause Trump has apparently been violating since he became president. And House Democrats have raised questions about the president's involvement in deciding whether the FBI headquarters should move from its current site in downtown Washington, D.C. They're asking whether he wants to prevent another hotel from moving in across the street from the Trump International.